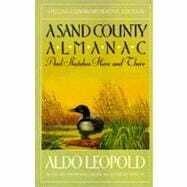 This special edition of the highly acclaimed A Sand County Almanac commemorates the one-hundredth anniversary of the birth of Aldo Leopold, one of the foremost conservationists of our century. First published in 1949 and praised in The New York Times Book Review as "full of beauty andvigor and bite," A Sand County Almanac combines some of the finest nature writing since Thoreau with an outspoken and highly ethical regard for America's relationship to the land. The volume includes a section on the monthly changes of the Wisconsin countryside; another section that gathers together the informal pieces written by Leopold over a forty-year period as he traveled around the woodlands of Wisconsin, Iowa, Arizona, Sonora, Oregon, Manitoba, and elsewhere; anda final section in which Leopold addresses more formally the philosophical issues involved in wildlife conservation. As the forerunner of such important books as Annie Dillard's Pilgrim at Tinker Creek, Edward Abbey's Desert Solitaire, and Robert Finch's The Primal Place, this classic work remainsas relevant today as it was forty years ago. Aldo Leopold, long a member of the National Wildlife Federation's Conservation Hall of Fame, was posthumously honored in 1978 with the John Burroughs Medal in tribute to a lifetime of work in conservation and, in particular, for A Sand County Almanac. Robert Finch is the author of The Primal Place and Common Ground: A Naturalist's Cape Cod.